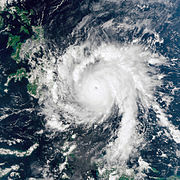 Typhoon Bopha struck some parts of Palau and then southern Philippines on December 3 .The storm brought heavy rain and strong winds of up to 160 mph (260 kmph). Bopha has caused severe damage. It has destroyed homes (over 80,000), uprooted trees, caused flooding and landslides, and disrupted transportation. Many areas have power outages. Over 600 people have died, and millions have been affected by the storm. Many international organizations are trying to help the people. Both Palau and the Philippines are island nations in the Pacific Ocean. Palau has over 200 islands and the Philippines has over 7,000.